The first-of-its-kind world-class exhibit, focuses largely on finds from Jericho, Herodion and Jerusalem, with a bit of exposure to other Herod-related sites in Israel. Framed as a story, the exhibit begins with the throne room from Herod’s third palace at Jericho – the room in which Herod died – and ends with Herod’s mausoleum from Herodion. While the exhibit focuses largely on Herod as a builder, it looks more at the lavishness of his construction and lifestyle than at his amazing feats of engineering. Also, between the three major sites covered, there are artifacts from other places like Masada, as well as a detour into Herod’s background — the world of the Roman Empire. 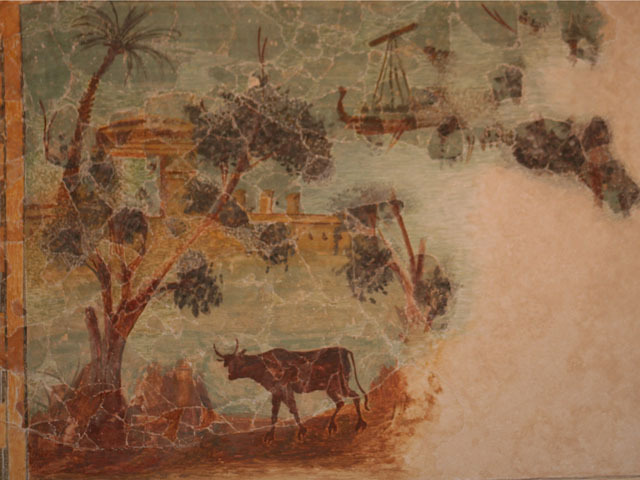 We see multiple examples of gorgeous and expensive frescoes, more delicate secco paintings, carved stonework, stucco pieces, evidence of imported food products and extensive mosaics and tiled floors. Videos with 3-D computer-generated reconstructions help us to envision Herod’s grand structures in the context of today’s archaeological sites. All of this paints a clear picture of Herod’s luxurious lifestyle. The extensive finds from Herod’s mausoleum have never before been displayed publicly, and on this count the exhibit does not disappoint. 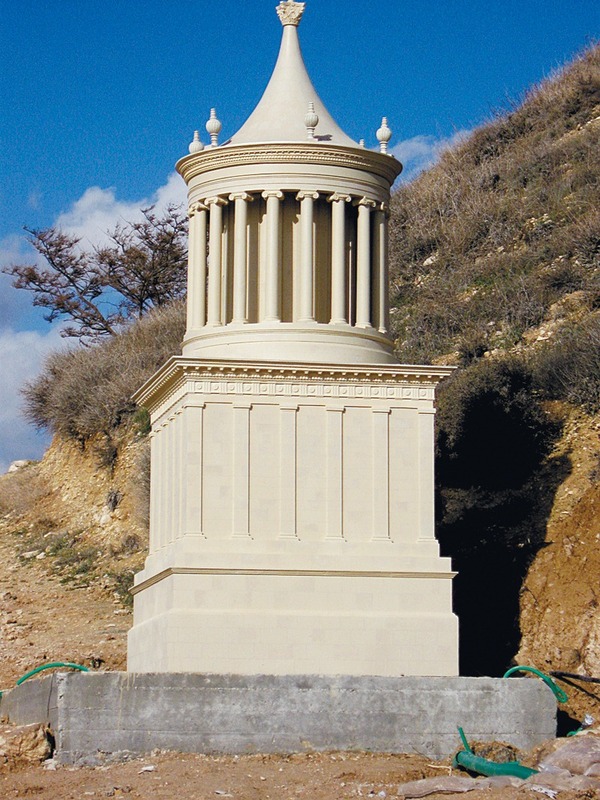 The original multi-level mausoleum towered over 75 feet high and was elaborately decorated. For this exhibit, they reconstructed two pieces of the top level, which presumably held Herod’s actual grave. I personally was amazed to see how much they had found, previously assuming they guessed what it looked like based on a few small pieces. Not so! 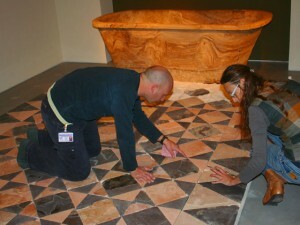 They found (and reconstructed here) so much that they had to reinforce the floor to hold that much weight. 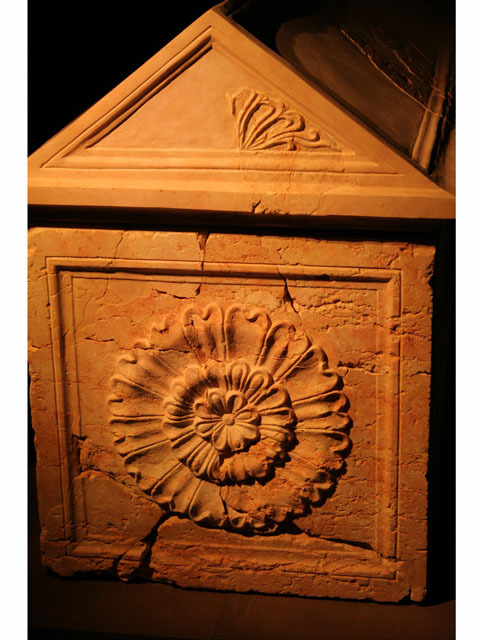 The archaeologists also found pieces of three sarcophagi — two of the traditional white limestone and one of an exquisite red limestone — all reconstructed at the exhibit. The red one had been purposely smashed into hundreds of little pieces. The archaeologists believe the two white ones belonged to family members, whereas the red one was Herod’s personal sarcophagus. It was presumably smashed by the Zealots who inhabited Herodion about 70 years after Herod’s death, during the Great Revolt. They hated Herod and all he stood for, and thus desecrated his tomb and probably the entire Mausoleum. Thus they created the mystery that lasted for 2000 years, and that this exhibit finally answers: where did Herod’s final journey end? If I were to point to any weak spots in the exhibit, I’d say it could use a bit more coverage of Masada and especially Caesarea. Similarly, some of the Sebaste/Samaria findings would have been as helpful as the Jericho ones. I know that might have been seen as tangential to the main storyline of the exhibit, but they already digressed to a full room on Herod’s background in the Roman world, and a half room on the food products he imported. A drop on Caesarea would have been appropriate, and only slightly more tangential than the room dedicated to Herod’s building work in Jerusalem. But all in all it is an excellent exhibit which I’d be happy to take you to see! To follow the King’s Final Journey, visit the Israel Museum before October 5, 2013. How hard is it to get to the actual Herodion? Not difficult at all, with a vehicle. Probably a bit tougher with public transport, if at all. A great small site that is easily reachable from Jerusalem, and close by.